Over the course of the last week, the front-facing camera in the iPhone XS and XS Max has been receiving a lot of attention because the selfies captured on the new devices are drastically different from those captured with the iPhone X or earlier iPhone models. We covered the issue in our recent iPhone XS Max vs. iPhone X camera comparison, where we did see the smoothing effect, but the front-facing camera's performance has garnered so much attention since then that we wanted to more prominently highlight the problem. When taking a selfie in a situation where lighting is less than ideal, such as indoors or outdoors in areas with lower lighting, the iPhone XS Max appears to be applying a drastic smoothing effect that can hide freckles, blemishes, and other issues. In full outdoor lighting the problem is less apparent, which has led to speculation that the skin smoothing is actually a result of some heavy-handed noise reduction techniques. You can test the new camera yourself with an iPhone XS or XS Max and an older iPhone like an iPhone X model by taking selfies indoors and outdoors and comparing the differences between the two. In almost all cases where the lighting is low or uneven, photos captured with an iPhone XS Max look dramatically different. It makes sense that we'd see differences between the iPhone XS and say, an iPhone 8 because the front-facing cameras are different, but as far as we know, the iPhone X and XS are using the same 7-megapixel front-facing camera. Apple detailed several changes to the rear-facing camera in the iPhone XS models, but beyond a new Neural Engine, there were no announced changes to the TrueDepth camera system. Because the camera is the same, Apple is doing something different with the way photos are processed after being captured, which could be related to the new HDR features that have been implemented. Apple has a new A12 chip and next-generation Neural Engine that are aiding in photo processing to enable a Smart HDR feature that applies to both the rear and front-facing cameras. Turning off HDR does not remove the smoothing effect, nor does tweaking any other camera setting, so if the ultra skin smoothing is a result of something like unintentional excessive noise reduction, it needs to be tweaked on Apple's end through a software update. YouTuber Unbox Therapy recently demoed the issue with a series of selfies. While it's mostly the front-facing camera that's been under scrutiny, this is a problem that affects both the front-facing and rear-facing cameras and it's not entirely limited to skin. Excessive smoothing can be seen affecting other images as well. There has been speculation that Apple intentionally implemented the skin smoothing feature to mimic the beauty mode that's popular in Asia and common on some other smartphones, but it's not clear if that was Apple's intention. Many MacRumors readers and Reddit users have reported the issue to Apple, and given that this issue has received so much attention, we may see front-facing camera tweaks in a future iOS update. Ah, Unbox Therapy. Shouty unrehearsed reviews by a person whose head most resembles an owl. So. Apple identifies you're a bit ugly. But rather than upset you by telling you, fixes it for you so you look smokin' hot for your friends. And now you're annoyed? When the iphone 6 has a better selfie cam than the xs u know there's a problem with this phone. I don't think apple will fix this so have fun with your super-blurred selfies for all of you who enjoy water-paintings. Also i'd just like to point out that people are defending apple in removing large amounts of detail from their photos. OMG, leave that feature on! I'm ordering a Xs Max right now! is it "users" or just Unbox Therapy? Frankly, a “selfie cam” is the least important feature on any phone. 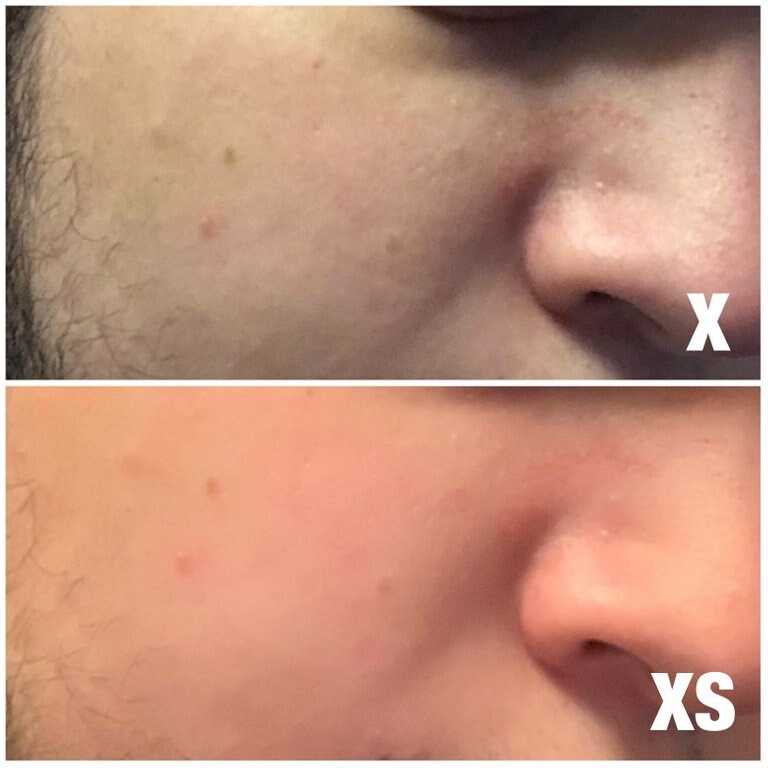 As for the “super blurred” complaint just because some redditor couldn’t see their blackheads anymore, way to exaggerate. It looks really bad. Noticed it on launch day. The X shows much more detail(my preference).